Spring is here! Finally! This winter has been cold, wet, and dreary. Normally, I would consider it a delightfully wonderful winter if you’re a native Northwesterner. But, after months and months and months of hardly seeing the sun here in Seattle, I’m ready for a change in the season. This Raw Beet and Carrot Salad is a wonderful spring detox food… or just a food to support bile flow. Beets provide anti-inflammatory, detox, and antioxidant support. They are also high in minerals and vitamins. Their greens are a wonderful food, too! We like to saute them in pasture-raised ghee and sprinkle truffle sea salt on top prior to serving. For clients with liver and gallbladder issues, beets are usually one of the first foods I ask them to introduce as they help promote healthy bile flow. This salad is a wonderful introductory to the world of beets! As a beginning amount, I usually recommend a forkful per meal and slowly increase from there. In a medium bowl, toss the shredded beets and carrots. In a small bowl, whisk lemon juice and olive oil together. Season with sea salt and pepper. Toss to coat the salad. Make a few hours ahead of time and let sit in the fridge in order for flavors to marinade. I remember reading my mom’s recipes when I was a little girl. There was a recipe from my Great Grandma Ruth entitled “Bone Soup” and I thought it was the funniest thing ever. Why would ANYONE want to make soup out of bones? There’s no meat on them?! I used to think that my great grandma, who raised 7 children in the hills of southern Oregon was crazy. I mean… who makes soup out of bones? Well, growing up has a way of saying “I told you so” and the simple answer is: Me. I drink a quart or two a day, it is the stuff that gives me energy and has been so instrumental in my healing journey. I use it for all of my soup bases and will add it to casseroles, roasted veggies, mashed veggies. You name it and it’s probably being added to a meal. Incognito style. Broth is ancient – think Stone Age ancient and go back to the time where organ meats were king. The first soups were made by placing hot rocks in the abdominal pouches of butchered animals in order to slowly cook up mixtures of meat, bone, fat, herbs, wild grains and vegetables. To this day, there is some record of nourishing broth, either oral or written, in almost every culture. Until the modern invention of mass canning (think Campbell’s and Progresso), many homes had a cauldron or large pot in which they kept broth simmering on the back burner. Even Downton Abbey gave a nod in Season 5 to the importance broth had in by-gone eras with The Dowager Countess (I just love her character) quipping, “every good lady’s maid should know how to make a restorative broth.” While I have no dreams or aspirations of becoming a lady’s maid, I do think that every single person should know how to make a restorative broth. If you’ve never had Polish Hunter’s Stew, known as Bigos, it’s fantastic! Traditionally a winter stew that was made to help pump the lifeblood back into someone (let’s be honest, Polish winters are brutal), you don’t have to be a fan of sauerkraut to enjoy it. The flavors mute while cooking and the result is a fantastic creamy stew that is so so so fantastic, all you want to do is eat and eat and eat. I’ve had worse problems in life than wanting to eat all the bigos. Homemade sauerkraut is best for this dish – I make my sauerkraut by the 2 liter container and weight out how much I need. You can buy sauerkraut for this dish, but make sure it’s a good quality sauerkraut, many of the canned stuff and even the “barrel cured” brands have cruddy additives in it. This is one stew that really does get better with age. It was about day 3 of leftovers and everything was enhanced and fantastic. Enjoy it the first night and love it a few days in! Either way, here’s a fantastic stew if you find yourself with a superabundance of homemade sauerkraut (not that that ever really happens in my household). Some people are the ketchup with fries people. And I have yet to understand them. I’ve always been the fries with ketchup person. As in, “Yes. I did just go through half a bottle of ketchup in one sitting, why do you ask?” So when I started becoming more aware of what I was eating in ketchup – high-fructose corn syrup, corn syrup solids, additives, “natural flavors” – whatever those mean, MSG, gluten (WHY does gluten have to be in ketchup?!) and random chemicals that even my five hundred courses in biology, chemistry and nutrition didn’t set me up to understand, I knew it was time to look elsewhere. I tend to stay away from Heinz and Hunt’s – I disagree with their use of and support of GMO products and their lobbying against a consumer’s right to know what’s GMO and what’s not GMO. Even though both make an organic line, I just can’t bring myself to support them and take my business elsewhere. I recently purchased a bunch of grass-fed beef and the cow is in process so… I have to clean out my freezer. Which means I eat my older beef as quickly as possible. Makes a lot of sense, doesn’t it? This morning it was taco meat. I ate it with some scrambled eggs and guacamole for a delish high-fat/high-calorie meal (it’s cold, windy and rainy over here in Western Oregon). I guess you could say I’m jonesing for more tropical climates… or San Diego. Which ever is cheapest. Okay. So, here’s my super easy recipe. I make a whole bunch of it up at once and buy my spices organic and in bulk. There are probably places that you can do this from wherever you live. Here in Portland, we have Bob’s Red Mill over in Milwaukie. They have bulk organic spices and really reasonable prices. I buy my own spice jars and have cute labels. Heck. I even alphabetize my spices. Don’t judge me. You know you do it, too. First and second letter. Once I’ve made a mega batch of taco seasoning mix, I dump it in a half-pint mason jar and put a lid on it. I mark on the lid my ratio – 1 ½ tbsp mix (sometimes I feel like having a bit more zip and throw more in) to a half cup of water. Below is the recipe for a single batch and is for a pound of beef. If cooking more beef, simply double, triple, etc the recipe. When I make my large quantities, I usually make 6 batches at once – those are included in the parenthesis. Enjoy! 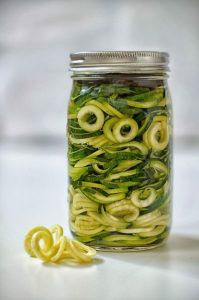 Zucchini noodles are a tasty alternative to wheat-based noodles but can often be a tad bit soggy. “Wetting” the noodles with some salt can help firm them up a bit when they are cooked, but they can still be soggy. Fermented zucchini noodles, on the other hand, don’t get soggy. Ever. At least not in the gazillions of times that I’ve made them. You’ll want a Spiralizer – either one that sits on the counter or a handheld tool. It just makes life easier in every aspect. In the summer, our Spiralizer is a permanent fixture on the counter. And, spiralizing veggies is a fun and creative way to get kids to eat their veggies (hint, hint, parents). Other tools needed will include a jar with sealable lid, sea salt, weight and filtered water.
? Well, I like it now. So that argument is moot. But I used to think it was nasty. Incorporating liver in your diet should be a necessity. Unfortunately in the United States, we view organ meats and sub-par. Why have organ meats, the most nutrient-dense of the whole animal, when you can have a nice flank steak? Don’t get me wrong, I love a good marinated flank steak as much as the next person… but it just doesn’t match up for the vitamin powerhouse that organ meats provides. In fact, according to an arcticle by Chris Kresser, organ meats contain 10 to 100 times the nutritional benefit than corresponding muscle meats. (He also has a nifty chart comparing the nutrition of liver against other foods.) Organ meats were once so prized in traditional cultures that they were given first to the pregnant and women of child-bearing years. Talk about a super prenatal! If you’re not ready to take the liver and onions plunge, and I’m there with ya so don’t worry, than hiding it in your muscle meat might be the way to go. I usually direct my clients with putting a ¼ lb of ground liver in with 1 lb grass-fed/organic/pasture-raised/etc ground beef. They look at me like I’m crazy. Or have a new growth growing out of my face and it suddenly appeared. Either way, it’s the easiest way to hide the flavor. Yes, it does taste slightly gamey. But it’s not bad. In fact, the flavor is like a mild venison. And who doesn’t love venison?! To grind the liver, thaw in cold water and blend in blender until it’s all broken up. Or, if you have a fancy meat grinder, you may use that. Cutting it on the cutting board also works but if you’re trying to hide it from a picky eater, the pieces might be too big. 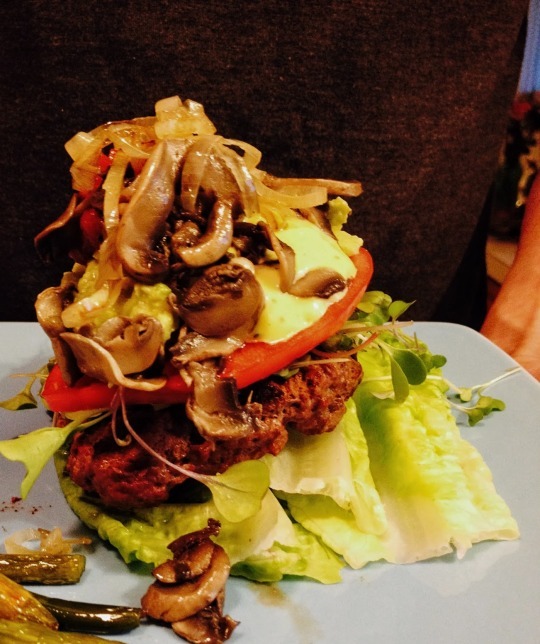 Cook as you would any burger. And top with your favorite toppings. 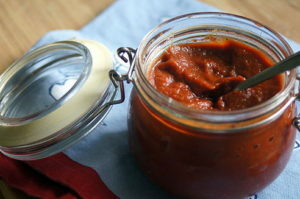 Might I recommend my Fermented Ketchup? When you’re marrying an Italian man (who has more Irish than Italian but who am I to question his ethnic claim? ), there’s a few things you need to quickly add to your repertoire. The first being a tasty marinara. The second being a bolognese. The third is the caveat that both must taste authentic and the way his Italian grandmother makes them. It’s only his childhood memories that I’m up against. Thankfully, he was willing to share a few of their secrets to help me improve what I thought was already a pretty good sauce. The below is what he and I have since concocted and perfected. 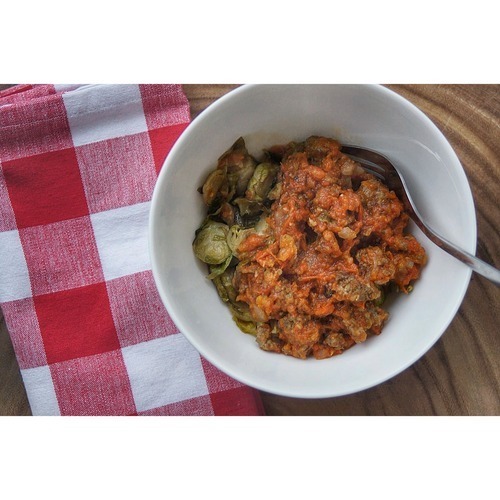 I serve it over my Brussels Sprouts Braised with Mustard because when you’re paleo, you discover that traditional foods don’t necessarily have to be eaten traditionally. This also tastes fantastic with zoodles (zucchini noodles) and spaghetti squash. And when we really feel like splurging, over paleo noodles. Because sometimes you just want a noodle. In a mixing bowl, combine spice mix and ground pork (or just use 1 lb pork sausage if you can find a good source with no added sugar). Set aside for 30 minutes. Heat a medium-sized dutch oven, over medium heat, cook the pork until slightly browned, stirring often and breaking up the larger pieces. Remove pork from dutch oven and set aside, keeping the fat at the bottom of the pan. Add the onion and ghee to the sausage fat and continue to cook until translucent. Add garlic and saute until lightly golden and very aromatic. Dump in the tomatoes, juices and all, and the tomato paste. Add the spices and stir. Reduce heat to low and put a lid slightly on. Simmer, stirring often, for 3 hours. After two hours, add the meat and continue simmering. Serve warm! And just like most Italian recipes, this makes enough to feed the whole Roman army! It’s been a few weeks since I last posted a recipe. I sprained my ankle right before Christmas and was down for the count. I’m finally getting around enough that cooking, carrying plated food over to the window where I take my photos and balancing a camera… and maintaining balance myself, aren’t daunting tasks. Not to mention that the natural lighting has been working against me. It’s been exceptionally dark and dreary these past few weeks – even for Oregon. We’ve been socked in fog “‘thicker than frozen snot on a door knob,” according to Portland’s National Weather Service Office. So much so that my dad, who’s an umpteenth generation Oregonian, commented on how miserable it is. Today’s soup is perfect for the dead of winter. I have fond memories of playing at a friend of our family’s farm out of Troutdale, OR. 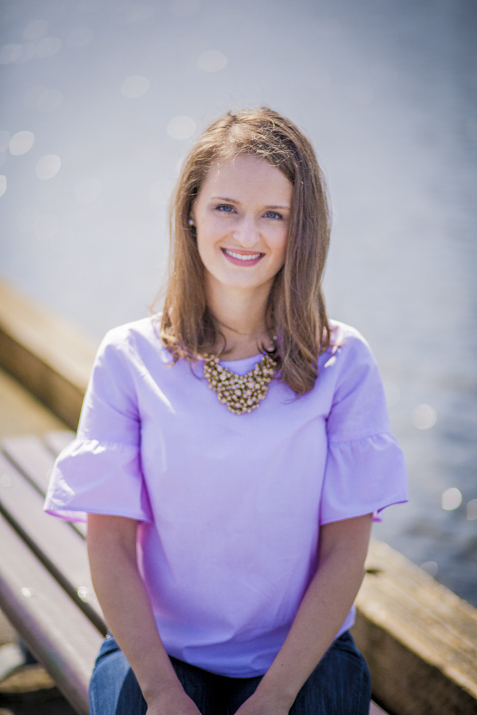 They lived in a house up on a bluff above the Sandy River and running around exploring and tormenting the older brother was heaven (it was two girls against one boy – poor kid!). They were (and still are) basil farmers and their house always smelled of the delicious, rich smell of fresh basil. So many fond memories in that house up on the bluff. My family was so taken with this simple soup that my mother had to ask for the recipe and it’s been a staple ever since in our family. I’ve made a few modifications to it over the years but for the most part, it remains the same. The best way to describe this soup is simple Italian peasant food. It’s nothing remarkable when you look at the ingredients but the flavors meld themselves together in such a harmonious blend… it’s impossible to not over-indulge and have one too many bowls. But before the recipe, a few notes: You really want to use napa cabbage (also known as Chinese cabbage) with this soup. It’s far more delicate than your typical “green cabbage” and cooks down nicely. You retain much of the crunch and texture of the cabbage but it’s not your “normal” thick pieces. 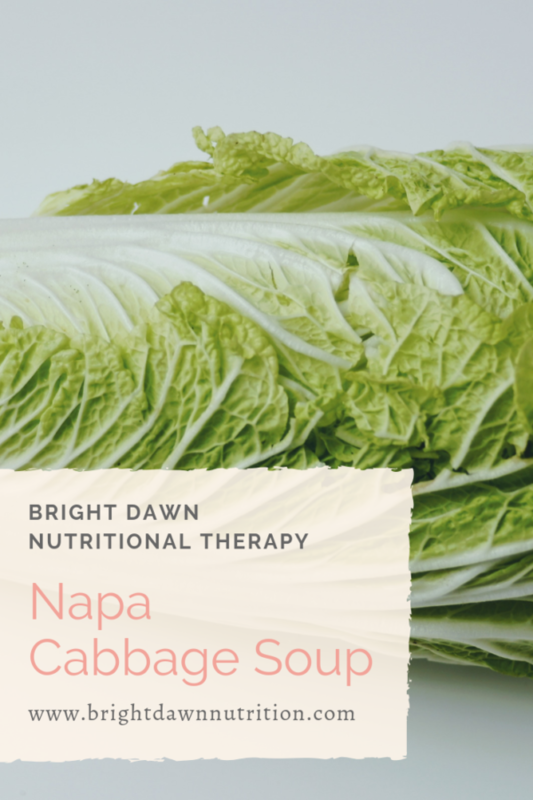 Napa cabbage can easily be found at a farmer’s market or a natural foods store – if you aren’t sure which is napa, just ask! In a medium-large stock pot, over medium heat, cook bacon (or pancetta) until done. Remove bacon from pan, leaving fat at the bottom. Cut up cabbage while bacon is cooking. Add garlic and saute in the bacon fat until golden, stirring often. Add tomatoes and juice from can and shredded cabbage. Stir. Add filtered water and meat stock and stir. Cover with a lid and simmer on low for about 20 minutes, or until cabbage is cooked. Add bacon back to soup and add sea salt and pepper to taste. Serve with shredded Parmesan (optional) and an extra dollop of fat (such as coconut oil, grass-fed ghee, or more bacon fat) (optional).